Of course, there’s nothing new about going to flea markets and thrift stores to find treasures to decorate your house, but the current emphasis on recycling and green lifestyle make the old hobby of shopping secondhand seem hip again. 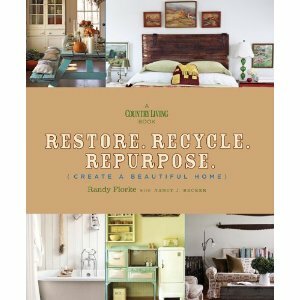 Restore Recycle Repurpose by Randy Florke is just the book to inspire you. Arranged by area (entryways, kitchens, home office, bathroom, outdoor) Florke gives you tips on what to look for – how to determine the quality of a piece and whether it might be salvageable as well as fun and unique ways to use items in new ways. While the majority of the rooms would be considered “country” or “cottage”, they are all refreshingly open and clutter-free; it is not hard to imagine the same rustic pitcher or chair fitting in comfortably in many modern or eclectic rooms. Throughout, Florke effortlessly combines practicality, comfort, eco-friendly options all while honoring the past.